I’m pretty sure I’m going to say this for most of these but this one is my favorite! I am enjoying reading these and discussing the G(r)eek notes in the back with my son. Its has been a fun bonding experience. Of course we can not agree on our favorites. I loved this retelling the most so far compared to the others. He said his favorite is still Athena. On the artwork I’m a fan as I am with the others. Hades has always been one of my top three favorite Greek Gods and I’ve always loved the story of Persephone and her abduction and why we have the seasons. In the beginning we get introduced to the underworld as told from what happens after you die. The author goes through all the steps and into the different sections and who you would encounter. Then we get to the brooding formidable Lord of the Underworld himself and then start the story of the abduction of Persephone. Kore and Demeter have a fight and Kore is abducted by Hades. We see Demeter go through her days of heartbreak and search for Kore ( Which when she comes upon Zeus I love what Hera says). 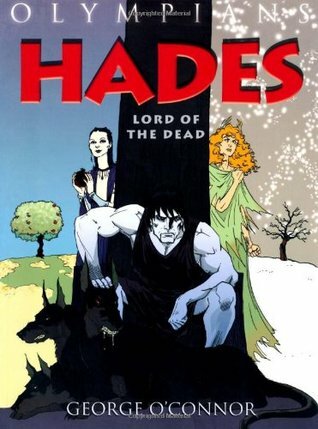 We also get to see how Hades tries to woo Kore and Kores transformation to Persephone. And just when Hades thought he had her falling for him and convinced to be the Queen of the underworld Hermes comes in and takes her back to Demeter and leaves Hades wondering if she is coming back to him. I find this series to be a fun read with action and great stories that I can enjoy and discuss with my son. I love the facts and questions at the end and again the G(r) eek notes have been wonderful to read so we can see why the author retold it the way he did. I think anyone who enjoys Greek myths would enjoy these. Young and old.